This selector sets how pages located below the current page will inherit permissions by default. New pages created below this level will inherit these permissions as well. 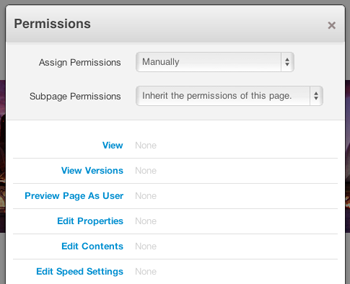 Sets subpages of the current page to inherit default permissions specificed by their selected page types. Sets subpages of the current page to inherit permissions set from the current page. 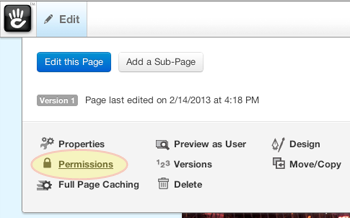 To inspect a page's permissions, mouse over the Edit button / pencil icon and click Permissions. 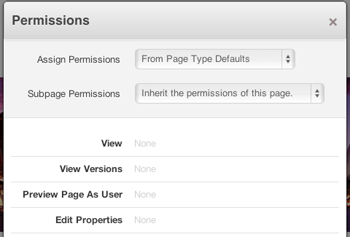 This option sets the page to inherit the permissions that are set for the page above the current page. Note that the access entities from the page above (in this case: Home) are listed. But the available permissions items are plain black text, not links, and cannot be edited. If we want to change access for this page, we'll need to edit permissions on the page above, or set the page to assign permissions differently. This this option applies the permissions that are set on the applied page type's Page Type Defaults. Note that once again we can't edit these permissions directly from the page. To change them, we'll need to edit the Page Type Default permissions, or set the page to assign permissions manually. This mode Allows manual selection of permissions for the current page. 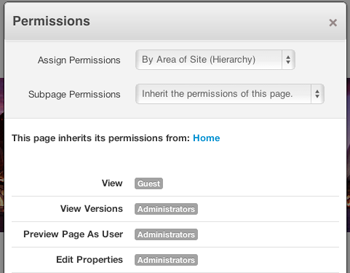 If pages below the current page are set to be assigned By Area of Site (Heirarchy), and the Subpage Permissions setting is set to Inherit the permissions of this page they will inherit the permissions set for the current page. Note that each of the permissions items we can set on this page are now rendered as blue links. We can click any of these items to add access entities.